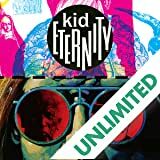 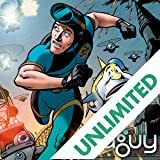 Every appearance of the DC Universe's youngest Head of State leading up to Mark Russell's critically acclaimed 2015 series-from the character's debut in 1973 to his appearances in SANDMAN, THE DARK KNIGHT STRIKES AGAIN and more! 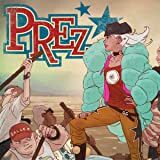 When a Constitutional amendment lowers the age of eligibility to run for public office, young people across the USA unite to elect the country's first teenaged president-the aptly named Prez Rickard! 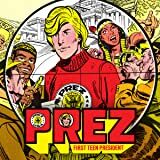 Created by Joe Simon and Jerry Grandenetti in 1973, Prez captured the spirit of his era, spreading a message of "Peace in our Time" and fighting government corruption in the form of the villainous Boss Smiley. 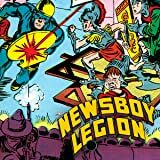 Though his term in office was short-lived, the idea of the nineteen-year-old political whiz kid nevertheless went on to inspire such comics greats as Frank Miller, Neil Gaiman, Ed Brubaker and Grant Morrison. 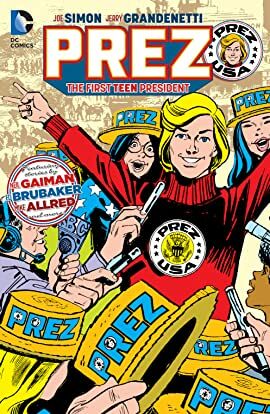 Collects PREZ #1-4, CANCELLED COMICS CAVALCADE #2, SUPERGIRL #10, SANDMAN #54, VERTIGO VISIONS: PREZ, THE DARK KNIGHT STRIKES AGAIN #2, THE MULTIVERSITY GUIDEBOOK #1.